^ a b c "Horseshoe Bend Hiking Guide" (PDF). National Park Service. October 2007. Archived from the original (PDF) on February 9, 2017. Retrieved November 26, 2014. ^ "Horseshoe Band". yourhikeguide.com. June 11, 2015. Archived from the original on June 6, 2017. Retrieved December 14, 2017. ^ a b c "Horseshoe Bend". visitarizona.com. Archived from the original on April 11, 2017. Retrieved December 14, 2017. ^ Craven, Scott (August 9, 2018). "How Horseshoe Bend Went Viral and What's Being Done to Manage the Crowds". The Arizona Republic. Retrieved August 16, 2018. 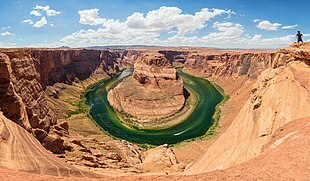 Wikimedia Commons has media related to Horseshoe Bend (Arizona).